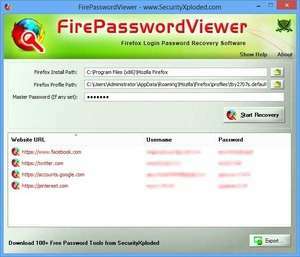 FirePasswordViewer is the GUI version of popular FirePassword tool to instantly recover login passwords stored by Firefox on your system. Firefox has a built-in password manager tool which stores username and passwords for all the visited websites. These credentials are stored in the encrypted form in the Firefox profile's database files such as key3.db and signons. Version 11.0 is a freeware program which does not have restrictions and it's free so it doesn't cost anything. For security reasons, you should also check out the FirePasswordViewer download at LO4D.com which includes virus and malware tests. Additional screenshots of this application download may be available, too.